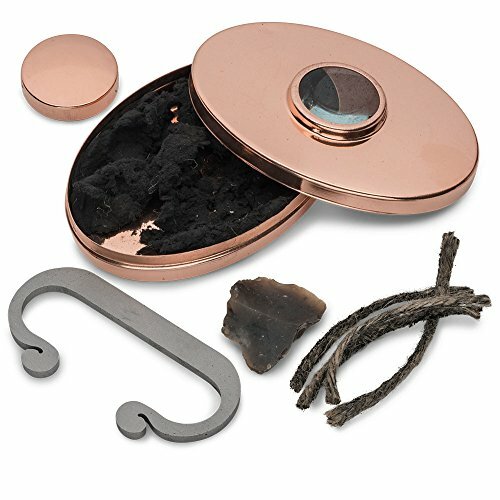 Believe it or not, this fire starter kit is the same type carried by fur traders and explorers of the Hudson Bay Company in Canada in the 1600's.The 3 x 4-1/2" Tinder Box contains "char cloth" (the cloth version of charcoal), some short strands of very dry Jute, a striking steel, a piece of flint, and a 6X magnifying lens). Detailed instructions are included for all us tenderfoots, but the basics are that you get a pinch of char cloth or dry rope fibers to flame up using either the lens on a bright sunny day or the sparks from the flint and steel when it is not sunny. It really works just the way it has for the last 300 years. Great fun for young and old alike. It really works just the way it has for the last 300 years. If you have any questions about this product by Garrett Wade, contact us by completing and submitting the form below. If you are looking for a specif part number, please include it with your message.